If you work in an academic library or otherwise provide support for research and scholarly communication, you have probably heard of ORCID (Open Contributor & Researcher Identifier) in terms of “ORCID iD,” a unique 16-digit identifier that represents an individual in order to mitigate name ambiguity. The ORCID iD number is presented as a URI (unique resource identifier) that serves as the link to a corresponding ORCID record, where disambiguating data about an individual is stored. For example, https://orcid.org/0000-0002-9079-593X is the ORCID iD for the late Stephen Hawking, and clicking on this link will take you to Hawking’s ORCID record. Data within ORCID records can include things like names(s) and other identifiers, biographical information, organizational affiliations, and works. Figure 1: This screenshot shows the types of data that can be contained in an ORCID record. Anyone can register for an ORCID iD for free, and individuals have full control over what data appears in their record, the visibility of that data, and whether other individuals or organizations are authorized to add data to their ORCID record on their behalf. Individuals can populate information in their ORCID record themselves, or they can grant permission to organizations, like research institutions, publishers, and funding agencies, to connect with their ORCID record as trusted parties, establishing an official affiliation between the individual and the organization. For example, Figures 2 and 3 illustrate an authenticated ORCID connection between an individual author and the University of Virginia (UVA) as represented in LibraOpen, the UVA Library’s Samvera institutional repository. These authenticated connections are made possible by configuring software systems to communicate with the ORCID registry through the ORCID API, which is based on OAuth 2.0. With individual researchers/contributors at the center, and their affiliated organizations connecting with them through the ORCID API, all participating organizations’ systems can also communicate with each other. In this way, ORCID not only serves as a mechanism for name disambiguation, it also provides a linchpin for system interoperability in the research and scholarly communication ecosystem. Figure 4: ORCID serves as a mechanism for interoperability between systems and data in the scholarly communication ecosystem. Graphic courtesy of the ORCID organization. Publishers, funders, research institutions (employers), government agencies, and other stakeholders have been adopting and using ORCID increasingly in their systems over the past several years. As a global initiative, over 5 million individuals around the world have registered for an ORCID iD, and that number continues to grow steadily as more organizations start to require ORCID iDs in their workflows. For example, over 65 publishers have signed on to an open letter committing to use ORCID in their processes, and grant funders are continuing to come on board with ORCID as well, having recently released their own open letter demonstrating commitment to ORCID. A full list of participating ORCID member organizations around the globe can be found at https://orcid.org/members. ORCID can be integrated into any system that touches the types of data contained within an ORCID record, including repositories, publishing and content management platforms, data management systems, central identity management systems, human resources, grants management, and Current Research Information Systems (CRIS). ORCID integrations can either be custom built into local systems, such as the example from UVA above, or made available through a vendor system out of the box. Several vendor-hosted CRIS such as Pure, Faculty 180, Digital Measures, and Symplectic Elements, already have built-in support for authenticated ORCID connections that can be utilized by institutional ORCID members, which provides a quick win for pulling ORCID data into assessment workflows with no development required. While ORCID has a public API that offers limited functionality for connecting with ORCID iDs and reading public ORCID data, the ORCID member API allows organizations to read from, write to, and auto-update ORCID data for their affiliated researchers. The ORCID institutional membership model allows organizations to support the ORCID initiative and benefit from the more robust functionality that the member API provides. ORCID can be integrated with disparate systems, or with one system from which data flows into others, as illustrated in Figure 5. In January of 2018, four consortia in the US – the NorthEast Research Libraries (NERL), the Greater Western Library Alliance (GWLA), the Big Ten Academic Alliance (BTAA), and LYRASIS – joined forces to form a national partnership for a consortial approach to ORCID membership among research institutions in the US, known as the ORCID US Community. The national partnership allows non-profit research institutions to become premium ORCID member organizations for a significantly discounted fee and employs staff to provide dedicated technical and community support for its members. As of December 1, 2018, there are 107 member organizations in the ORCID US Community. In addition to encouraging adoption of ORCID, a main goal of the consortium approach is to build a community of practice around ORCID in the US. Prior to 2018, any institutions participating in ORCID were essentially going it alone and there were no dedicated communication channels or forums for discussion and sharing around ORCID at a national level. However, with the formation of the ORCID US Community, there is now a website with community resources for ORCID adoption specific to the US, dedicated communication channels, and an open door to collaboration between member institutions. Among ORCID US Community member organizations, just under half have integrated ORCID with one or more systems, and the other slightly more than half are either in early planning stages or technical development. (See the ORCID US Community 2018 newsletter for more information.) As an ecosystem, ORCID relies not only on organizations but also the participation of individual researchers, so all members have also been actively reaching out to their affiliated researchers to encourage them to register for, connect, and use their ORCID iD. The more people and organizations/systems using ORCID, the more all stakeholders can benefit from ORCID by maintaining a record of an individuals’ scholarly and cultural contributions throughout their career, mitigating confusion caused by name ambiguity, assessing individual contributions as well as institutional impact, and enabling trustworthy and efficient sharing of data across scholarly communication workflows. Effectively, ORCID represents a paradigm shift from siloed, repetitive workflows to the ideal of being able to “enter once, re-use often” by using ORCID to transfer data between systems, workflows, and individuals, ultimately making everyone’s lives easier. Two days after ProQuest completed their acquisition of Ex Libris in December 2015, Ex Libris announced the launch of their new online Customer Knowledge Center. In the press release for the Knowledge Center, the company describes it as “a single gateway to all Ex Libris knowledge resources,” including training materials, release notes, and product manuals. A defining feature is that there has never been any paywall or log-on requirement, so that all Knowledge Center materials remain freely accessible to any site visitor. Historically, access to documentation for automated library systems has been restricted to subscribing institutions, so the Knowledge Center represents a unique change in approach. The problem with how Ex Libris frames their press release is that it elides the difference between mere openness and actual open access. They are a for-profit company, and their currently burgeoning market share is dependent upon a software-as-a-service (SaaS) business model. Therefore, one way to describe their approach in this case is orangewashing. During a recent conversation with me, Margaret Heller came up with the term, based on the color of the PLOS open access symbol. Similar in concept to greenwashing, we can define orangewashing as a misappropriation of open access rhetoric for business purposes. What perhaps makes orangewashing more initially difficult to diagnose in Ex Libris’s (and more broadly, ProQuest’s) case is that they attempt to tie support for open access to other product offerings. Even before purchasing Ex Libris, ProQuest had been including an author-side paid open-access publishing option to its Electronic Thesis and Dissertation platform, though we can question whether this is actually a good option for authors. For its part, Ex Libris has listened to customer feedback about open access discovery. As an example, there are now open access filters for both the Primo and Summon discovery layers. Given the above information, in the case of the Knowledge Center, it is tempting to give Ex Libris the benefit of the doubt. As an access services librarian, I understand how much of a hassle it can be to find and obtain systems documentation in order to properly do my job. I currently work for an Ex Libris institution, and can affirm that the Knowledge Center is of tangible benefit. Besides providing easier availability for their materials, Ex Libris has done fairly well in keeping information and pathing up to date. Notably, as of last month, customers can also contribute their own documentation to product-specific Community Knowledge sections within the Knowledge Center. Nevertheless, this does not change the fact that while the Knowledge Center is unique in its format, it represents a low bar to clear for a company of Ex Libris’s size. Their systems documentation should be openly accessible in any case. Moreover, the Knowledge Center represents openness—in the form of company transparency and customer participation—for systems and products that are not open. This is why when we go back to the Knowledge Center press release, we can identify it as orangewashing. Open access is not the point of a profit-driven company offering freely accessible documentation, and any claims to this effect ultimately ring hollow. So what is the likely point of the Knowledge Center, then? We should consider that Alma has become the predominant service platform within academic libraries, with Primo and Summon being the only supported discovery layers for it. While OCLC and EBSCO offer or support competing products, Ex Libris already held an advantageous position even before the ProQuest purchase. Therefore, besides the Knowledge Center serving as supportive measure for current customers, we can view it as a sales pitch to future ones. This may be a smart business strategy, but again, it has little to do with open access. Two other recent developments provide further evidence of Ex Libris’s orangewashing. The first is MLA’s announcement that EBSCO will become the exclusive vendor for the MLA International Bibliography. On the PRIMO-L listserv, Ex Libris posted a statement [listserv subscription required] noting that the agreement “goes against the goals of NISO’s Open Discovery Initiative…to promote collaboration and transparency among content and discovery providers.” Nevertheless, despite not being involved in the agreement, Ex Libris shares some blame given the long-standing difficulty over EBSCO not providing content to the Primo Central Index. As a result, what may occur is the “siloing” of an indispensable research database, while Ex Libris customers remain dependent on the company to help determine an eventual route to access. Secondly, in addition to offering research publications through ProQuest and discovery service through Primo/Summon, Ex Libris now provides end-to-end content management through Esploro. Monetizing more aspects of the research process is certainly far from unusual among academic publishers and service providers. Elsevier arguably provides the most egregious example, and as Lisa Janicke Hinchliffe notes, their pattern of recent acquisitions belies an apparent goal of creating a vertical stack service model for publication services. In considering what Elsevier is doing, it is unsurprising—from a business standpoint—for Ex Libris and ProQuest to pursue profits in a similar manner. That said, we should bear in mind that libraries are already losing control over open access as a consequence of the general strategy that Elsevier is employing. Esploro will likely benefit from having strong library development partners and “open” customer feedback, but the potential end result could place its customers in a more financially disadvantageous and less autonomous position. This is simply antithetical to open access. Over the past few years, Ex Libris has done well not just in their product development, but also their customer support. Making the Knowledge Center “open to all” in late 2015 was a very positive step forward. Yet the company’s decision to orangewash through claiming support for open access as part of a product unveiling still warrants critique. Peter Suber reminds us that open access is a “revolutionary kind of access”—one that is “unencumbered by a motive of financial gain.” While Ex Libris can perhaps talk about openness with a little more credibility than their competitors, their bottom line is still what really matters. This year’s Open Access Week at my institution was a bit different than before. With our time constrained by conference travel and staff shortages leaving everyone over-scheduled, we decided to aim for a week of “virtual programming”, with a week of blog posts and an invitation to view our open access research guide. While this lacked the splashiness of programming in prior years, in another way it felt important to do this work in this way. Yes, it may well be that only people already well-connected to the library saw any of this material. But promotion of open access requires a great deal of self-education among librarians or other library insiders before we can promote it more broadly. For many libraries, it may be the case that there are only a few “open access” people, and Open Access Week ends up being the only time during the year the topic is addressed by the library as a whole. There were a few shakeups in scholarly communication and open access over the past few months that made some of these discussions more broadly interesting across the academic landscape. The on-going saga of the infamous Beall’s List has been a major 2017 story. An article in the Chronicle of Higher Education about Jeffrey Beall was emailed to me more than once, and captured the complexity of why such a list is both an appealing solution to a problem but also reliant on sometimes questionable personal judgements. Jeffrey Beall’s attitude towards other scholarly communications librarians can be simplistic and vindictive, as an interview with Times Higher Education in August made clear. June saw the announcement of Cabell’s Blacklist, which is based on Beall’s list, and uses a list of criteria to judge journal quality. At my own institution I know this prompted discussions of what the purpose of a blacklist is, versus using a vetted list of open access journals like the Directory of Open Access Journals. As a researcher in an article in Nature about this product states, it’s likely that a blacklist is more useful for promotion and tenure committees or hiring committees to judge applicants more than for potential authors to find good journals in which to publish. This also completely leaves aside the green open access options, in which authors can negotiate with their publisher to make a version of their article openly available–often the final published version, but at least the text before layout. While publishing an article in an open access journal has many benefits, green open access can meet the open access goals of faculty without worrying about paying additional fees or worrying about journal quality. But we still need to educate people on green open access. I was chatting with a friend who is an economist recently, and he was wondering about how open access worked in other disciplines, since he was used to all papers being released as working papers before being published in traditional journals. I contrast this conversation with another where someone in a very different discipline who was concerned that putting even a summary of research could constitute prior publication. Given this wide disparity between disciplines, we will always struggle with widely casting a message about green open access. But I firmly believe that there are individuals within all disciplines who will be excited about open access, and that they will get at least some of their colleagues on board–or perhaps their graduate students. These people may be located in the interdisciplinary side, with one foot in a more preprint-friendly discipline. For instance, the bioethicists in the theology department, or the history of science people in the history department. And even the most well-meaning people forget to make their work open access, so making it as easy as possible while not making it so easy that people don’t know why they would do it–make sure there are still avenues for conversation. Making things easy to do requires having a good platform, but that became more complicated in August when Elsevier acquired bepress, which prompted discussions among many librarians about their values around open access and whether relying on vendors for open access platforms was a foolish gamble (the Library Loon summarizes this discussion well). This is a complex question, as the kinds of services provided by bepress’s Digital Commons go well beyond a simple hosting platform, and goes along with the strategy I pointed out Elsevier was pursuing in my Open Access 2016 post. Convincing faculty to participate in open access requires a number of strategies, and things like faculty profiles, readership dashboards, and attractive interfaces go a long way. No surprise that after purchasing platforms that make this easy, Elsevier (along other publishers) would go after ResearchGate in October, which is even easier to use in some ways, and certainly appealing for researchers. All the discussion of predatory journals and blacklists (not to mention SciHub being ordered blocked thanks to an ACS lawsuit) seems old to those of us who have been doing this work for years, but it is still a conversation we need to have. More importantly, focusing on the positive aspects of open access helps get at the reasons people to participate in open access and move the conversation forward. We can do work to educate our communities about finding good open access journals, and how to participate legally. I believe that publishers are providing more green access options because their authors are asking for them, and we are helping authors to know how to ask. I hope we were not too despairing this Open Access Week. We are doing good work, even if there is still a lot of poisonous rhetoric floating around. In the years I’ve worked in scholarly communication I’ve helped make thousands of articles, book chapters, dissertations, and books open access. Those items have in turn gone on to be cited in new publications. The scholarly communication cycle still goes on. UPDATE: Just after this post was published, the U.S. Copyright Office released the long-awaited Discussion Document that was referenced below in this post. In this document the Copyright Office affirms a commitment to retaining the Fair Use Savings clause. Libraries rely on exceptions to copyright law and provisions for fair use to provide services. Any changes to those rules have big implications to services we provide. With potential changes coming in an uncertain political climate, I would like to take a look at what we know, what we don’t know, and how it’s all related. Each piece as it currently stands works in relation to the others, and a change to any one of them changes the overall situation for libraries. We need to understand how everything relates, so that when we approach lawmakers or create policies we think holistically. A few months back at the ALA Annual Conference in Chicago, I attended a panel called “Another Report from the Swamp,” which was a copyright policy specific session put on by the ALA Office of Information Technology Policy (OITP) featuring copyright experts Carrie Russell (OITP), Stephen Wyber (IFLA), Krista Cox (the Association of Research Libraries [ARL]). This panel addressed international issues in copyright in addition to those in the United States, which was a helpful perspective. They covered a number of topics, but I will focus on the Marrakesh Treaty and potential changes to US Code Title 17, Section 108 (Reproduction by libraries and archives). Stephen Wyber and Krista Cox covered the WIPO Marrakesh Treaty to Facilitate Access to Published Works for Persons Who Are Blind, Visually Impaired or Otherwise Print Disabled (aka the Marrakesh Treaty), which the US is a signatory to, but has not yet been ratified by the US Senate (see Barack Obama’s statement in February 2016). According to them, in much of the developing world only 1% of published work is available for those with print disabilities. This was first raised as issue in 1980, and 33 years later debates at WIPO began to address the situation. This treaty was ratified last year, and permits authorized parties (including libraries) to make accessible copies of any work in a medium that is appropriate for the disabled individual. In the United States, this is generally understood to be permitted by Title 17 sections Fair Use (Section 107) and Section 121 (aka the Chaffee amendment), though this is still legally murky 1. This is not the case internationally. Stephen Wyber pointed out that IFLA must engage at the European level with the European Commission for negotiations at WIPO, and there is no international or cross-border provision for libraries, archives, or museums. According to Krista Cox, a reason for the delay in ratification was that the Senate Committee on Foreign Relations wouldn’t move it to ratification unless it was a non-controversial treaty with no changes required for US law (and it should not have required changes). The American Association of Publishers (AAP) wanted to include recordkeeping requirements, which disability and library advocates argued would be onerous. (A good summary of the issues is available from the ALA Committee on Legislation). During the session, a staff attorney from the AAP stood up and made the point that their position was that it would be helpful for libraries to track what accessible versions of material they had made. While not covered in the session explicitly, a problem with this approach is that it would create a list of potentially sensitive information about patron activities. Even if no names were attached, the relatively few people making use of the service would make it possible to identify individual users. In any event, the 114th Congress took no action, and it is unclear when this issue will be taken up again. For this reason, we have to continue to rely on existing provisions of the US Code. Along those lines, the panel gave a short update on potential changes to Section 108 of the Copyright Act, which have been under discussion for many years. Last year, the Copyright Office invited stakeholders to set up meetings to discussion revisions. The library associations met with them last July, and generally while the beneficiaries of Section 108 find revisions controversial and oppose reform, the Copyright Office is continuing work on this. One fear with revisions is that the Fair Use exception clause (17 § 108 (F)(4)) would be removed. Krista Cox reported that at the Copyright Society of the USA meeting in early June 2017, the Copyright Office reported that they were working on a report with proposed legislation, but no one has seen this report [NOTE: the report is now available.]. Moving beyond the panel, let’s look at the larger implications for revisions to Title 17. There are some excellent reasons to revise Section 108 and others–just as the changes in 1976 reflected changes in photocopying technology 2, changes in digital technology and the services of libraries require additional help. In 2008, the Library of Congress Section 108 Study Group released a lengthy report with a set of recommendations for revisions, which can be boiled down into extending permissions for preservation activities (though that is a gross oversimplification). In 2015 Maria A. Pallante testified to the Committee on the Judiciary of the House of Representatives on a wide variety of changes to the Copyright Act (not just for libraries), which incorporated the themes from that 2008 report, in addition to other later discussions. Essentially, she says that changes in technology and culture in the past 20 years made much of the act unclear and required application of loopholes and workarounds that were legally unclear. For instance, libraries rely heavily on Section 107, which covers fair use, to perform their daily functions. This report points out that those activities should be explicitly permitted rather than relying on potentially ambiguous language in Section 107, since the ambiguity means some institutions are unwilling to perform activities that may be permitted due to fear. On the other hand, that ambiguous language opens up more possibilities that adventurous projects such as HathiTrust have used to push on boundaries and expand the nature of fair use and customary practice. The ARL has a Code of Best Practices in Fair Use that details what is currently considered customary practice. With revisions, there enters the possibility that what is allowed will be dictated by, for instance, the publishing lobby, and that what libraries can do will be overly circumscribed. Remember, too, that one reason for not ratifying the Marrakesh Treaty is that allowances for reproductions for the disabled are covered by Fair Use and the Chaffee amendment. Orphan works are another issue. While the Pallante report suggests that it would be in everyone’s interest to have clear guidance on what a good faith effort to identify a copyright holder actually meant, in many ways we would rather have general practice mandate this. Speaking as someone who spends a good portion of my time clearing permissions for material and frequently running into unresponsive or unknown copyright holders, I feel more comfortable pushing the envelope if I have clearly documented and consistently followed procedures based on practices that I know other institutions follow as well (see the Statement of Best Practices). This way I have been able to make useful scholarship more widely available despite the legal gray area. But there is a calculated risk, and many institutions choose to never make such works available due to the legal uncertainty. Last year the Harvard Office of Scholarly Communication released a report on legal strategies for orphan work digitization to give some guidance in this area. To summarize over 100 pages, there are a variety of legal strategies libraries can take to either minimize the risk of a dispute or reduce negative consequences of a copyright dispute–which remains largely hypothetical when it comes to orphan works and libraries anyway. Given that we do not know what will happen to the Copyright Office, nor exactly what their report will recommend, it is critical that we pay attention to what is happening with copyright. While more explicit provisions to allow more would be excellent news, as the panel at ALA pointed out, lawmakers are more exposed to Hollywood and the content creator organizations such as AAP, RIAA and MPAA and so may be more likely to see arguments from their point of view. We should continue to take advantage of provisions we currently have for fair use and providing access to orphan works, since exercising this right is one way we keep it. 2016: The Year Open Access Broke? It’s Open Access Week, which for scholarly communications librarians and institutional repository managers is one of the big events of the year to reflect on our work and educate others. Over the years, it has become less necessary to explain what open access is. Rather, everyone seems to have a perception of open access and an opinion about it. But those perceptions and opinions may not be based on the original tenets of the open access movement. The commercialization of open access means that it may now seem too expensive to pursue for individuals to publish open access, and too complicated for institutions to attempt without buying a product. In some ways, the open access movement is analogous to punk music–a movement that grew out of protest and DIY sensibilities, but was quickly coopted as soon as it became financially successful. While it was never free or easy to make work open access, changes in the market recently might make it feel even more expensive and complicated. Those who want to continue to build open access repositories and promote open access need to understand where their institution fits in the larger picture, the motivations of researchers and administration, and be able to put the right solutions together to avoid serious missteps that will set back the open access movement. Like many exciting new ideas, open access is partially a victim of its own success. Heather Morrison has kept for the past ten years a tally of the dramatic growth of open access in an on-going series. Her post for this year’s Open Access Week is the source for the statistics in this paragraph. Open access content makes up a sizeable portion of online content, and therefore is more of a market force. BASE now includes 100 million articles. Directory of Open Access Journals, even after the stricter inclusion process, has an 11% growth in article level searching with around 500,000 items. There are well over a billion items with a Creative Commons license. These numbers are staggering, and give a picture of how overwhelming the amount of content available all told is, much less open access. But it also means that almost everyone doing academic research will have benefited from open access content. Not everyone who has used open access (or Creative Commons licensed) content will know what it is, but as it permeates more of the web it becomes more and more relevant. It also becomes much harder to manage, and dealing with that complexity requires new solutions–which may bring new areas of profit. An example of this new type of service is 1Science, which launched a year ago. This is a service that helps libraries manage their open access collections, both in terms of understanding what is available in their subscribed collections as well as their faculty output. 1Science grew out of longer term research projects around emerging bibliometrics, started by Eric Archambault, and according to their About Us page started as a way to improve findability of open access content, and grew into a suite of tools that analyzes collections for open access content availability. The market is now there for this to be a service that libraries are interested in purchasing. Similar moves happened with alternative metrics in the last few years as well (for instance, Plum Analytics). But the big story for commercial open access in 2016 was Elsevier. Elsevier already had a large stable of open access author-pays journals, with fees of up to $5000. That is the traditional way that large commercial publishers have participated in open access. But Elsevier has made several moves in 2016 that are changing the face of open access. They acquired SSRN in May, which built on their acquisition of Mendeley in 2013, and hints at a longer term strategy for combining a content platform and social citation network that potentially could form a new type of open access product that could be marketed to libraries. Their move into different business models for open access is also illustrated in their controversial partnership with the University of Florida. This uses an API to harvest content from ScienceDirect published by UF researchers, but will not provide access to those without subscriptions except to certain accepted manuscripts, and grew out of a recognition that UF researchers published heavily in Elsevier journals and that working directly with Elsevier would allow them to get a large dataset of their researchers’ content and funder compliance status more easily. 1 There is a lot to unpack in this partnership, but the fact that it can even take place shows that open access–particularly funder compliance for open access versions–is something about which university administration outside the library in the Office of Research Services is taking note. Such a partnership serves certain institutional needs, but it does not create an open access repository, and in most ways serves the needs of the publisher in driving content to their platform (though UF did get a mention of interlibrary loan into the process rather than just a paywall). It also removes incentives for UF faculty to publish in non-Elsevier journals, since their content in those journals will become even easier to find, and there will be no need to look elsewhere for open access grant compliance. Either way, this type of move takes the control of open access out of the hands of libraries, just as so many previous deals with commercial enterprises have done. Open access is about the justice of wider access to academic content or getting back at the big publishers for exploitative practices. These people aren’t going to be that interested in a commercial open access solution, except inasmuch as it allows more access for a lower cost–for instance, a hosted institutional repository that doesn’t require institutional investment in developers. This group may include librarians and individual researchers. Open access is about following the rules for a grant-funded project since so many of those require open access versions of articles. Such requirements lead to an increase in author-pays open access, since publishers can command a higher fee that can be part of the grant award or subsidized by an institution. Repositories to serve these requirements and to address these needs are in progress but still murky to many. This group may include the Office of Research Services or Office of Institutional Research. “Open access” is synonymous with putting articles or article citations online to create a portfolio for reputation-building purposes. This last group is going to find something like that UF/Elsevier partnership to be a great situation, since they may not be aware of how many people cannot actually read the published articles. This last group may include administrators concerned with building the institution’s reputation. For librarians who fall into the first category but are sensitive to the needs of everyone in each category, it’s important to select the right balance of solutions to meet everyone’s needs but still maintain the integrity of the open access repository. That said, this is not easy. Meeting these variety of needs is exactly why some of these new products are entering the market, and it may seem easier to go with one of them even if it’s not exactly the right long-term solution. I see this as an important continuing challenge facing librarians who believe in open access, and have to underpin future repository and outreach strategies. Russell, Judith C.; Wise, Alicia; Dinsmore, Chelsea S.; Spears, Laura I.; Phillips, Robert V.; and Taylor, Laurie (2016) “Academic Library and Publisher Collaboration: Utilizing an Institutional Repository to Maximize the Visibility and Impact of Articles by University Authors,” Collaborative Librarianship: Vol. 8: Iss. 2, Article 4. Author Margaret HellerPosted on October 27, 2016 Categories open access, Scholarly CommunicationTags open access, what-if? Anyone who has worked on an institutional repository for even a short time knows that collecting faculty scholarship is not a straightforward process, no matter how nice your workflow looks on paper or how dedicated you are. Keeping expectations for the process manageable (not necessarily low, as in my clickbaity title) and constant simplification and automation can make your process more manageable, however, and therefore work better. I’ve written before about some ways in which I’ve automated my process for faculty collection development, as well as how I’ve used lightweight project management tools to streamline processes. My newest technique for faculty scholarship collection development brings together pieces of all those to greatly improve our productivity. First, here is the personnel situation we have for the institutional repository I manage. Your own circumstances will certainly vary, but I think institutions of all sizes will have some version of this distribution. I manage our repository as approximately half my position, and I have one graduate student assistant who works about 10-15 hours a week. From week to week we only average about 30-40 hours total to devote to all aspects of the repository, of which faculty collection development is only a part. We have 12 librarians who are liaisons with departments and do the majority of the outreach to faculty and promotion of the repository, but a limited amount of the collection development except for specific parts of the process. While they are certainly welcome to do more, in reality, they have so much else to do that it doesn’t make sense for them to spend their time on data entry unless they want to (and some of them do). The breakdown of work is roughly that the liaisons promote the repository to the faculty and answer basic questions; I answer more complex questions, develop procedures, train staff, make interpretations of publishing agreements, and verify metadata; and my GA does the simple research and data entry. From time to time we have additional graduate or undergraduate student help in the form of faculty research assistants, and we have a group of students available for digitization if needed. Those are our human resources. The tools that we use for the day-to-day work include Digital Measures (our faculty activity system), Excel, OpenRefine, Box, and Asana. I’ll say a bit about what each of these are and how we use them below. By far the most important innovation for our faculty collection development workflow has been integration with the Faculty Activity System, which is how we refer to Digital Measures on our campus. Many colleges and universities have some type of faculty activity system or are in the process of implementing one. These generally are adopted for purposes of annual reports, retention, promotion, and tenure reviews. I have been at two different universities working on adopting such systems, and as you might imagine, it’s a slow process with varying levels of participation across departments. Faculty do not always like these systems for a variety of reasons, and so there may be hesitation to complete profiles even when required. Nevertheless, we felt in the library that this was a great source of faculty publication information that we could use for collection development for the repository and the collection in general. We now have a required question about including the item in the repository on every item the faculty member enters in the Faculty Activity System. If a faculty member is saying they published an article, they also have to say whether it should be included in the repository. We started this in late 2014, and it revolutionized our ability to reach faculty and departments who never had participated in the repository before, as well as simplify the lives of faculty who were eager participants but now only had to enter data in one place. Of course, there are still a number of people whom we are missing, but this is part of keeping your expectation low–if you can’t reach everyone, focus your efforts on the people you can. And anyway, we are now so swamped with submissions that we can’t keep up with them, which is a good if unusual problem to have in this realm. Note that the process I describe below is basically the same as when we analyze a faculty member’s CV (which I described in my OpenRefine post), but we spend relatively little time doing that these days since it’s easier for most people to just enter their material in Digital Measures and select that they want to include it in the repository. The ease of integration between your own institution’s faculty activity system (assuming it exists) and your repository certainly will vary, but in most cases it should be possible for the library to get access to the data. It’s a great selling point for the faculty to participate in the system for your Office of Institutional Research or similar office who administers it, since it gives faculty a reason to keep it up to date when they may be in between review cycles. If your institution does not yet have such a system, you might still discuss a partnership with that office, since your repository may hold extremely useful information for them about research activity of which they are not aware. We get reports from the Faculty Activity System on roughly a quarterly basis. Faculty member data entry tends to bunch around certain dates, so we focus on end of semesters as the times to get the reports. The reports come by email as Excel files with information about the person, their department, contact information, and the like, as well as information about each publication. We do some initial processing in Excel to clean them up, remove duplicates from prior reports, and remove irrelevant information. It is amazing how many people see a field like “Journal Title” as a chance to ask a question rather than provide information. We focus our efforts on items that have actually been published, since the vast majority of people have no interest in posting pre-prints and those that do prefer to post them in arXiv or similar. The few people who do know about pre-prints and don’t have a subject archive generally submit their items directly. This is another way to lower expectations of what can be done through the process. I’ve already described how I use OpenRefine for creating reports from faculty CVs using the SHERPA/RoMEO API, and we follow a similar but much simplified process since we already have the data in the correct columns. Of course, following this process doesn’t tell us what we can do with every item. The journal title may be entered incorrectly so the API call didn’t pick it up, or the journal may not be in SHERPA/RoMEO. My graduate student assistant fills in what he is able to determine, and I work on the complex cases. As we are doing this, the Excel spreadsheet is saved in Box so we have the change history tracked and can easily add collaborators. 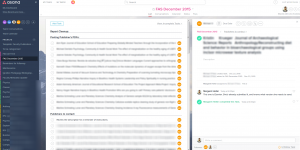 A view of how we use Asana for managing faculty collection development workflows. At this point, we are ready to move to Asana, which is a lightweight project management tool ideal for several people working on a group of related projects. Asana is far more fun and easy to work with than Excel spreadsheets, and this helps us work together better to manage workload and see where we are with all our on-going projects. For each report (or faculty member CV), we create a new project in Asana with several sections. While it doesn’t always happen in practice, in theory each citation is a task that moves between sections as it is completed, and finally checked off when it is either posted or moved off into some other fate not as glamorous as being archived as open access full text. The sections generally cover posting the publisher’s PDF, contacting publishers, reminders for followup, posting author’s manuscripts, or posting to SelectedWorks, which is our faculty profile service that is related to our repository but mainly holds citations rather than full text. Again, as part of the low expectations, we focus on posting final PDFs of articles or book chapters. We add books to a faculty book list, and don’t even attempt to include full text for these unless someone wants to make special arrangements with their publisher–this is rare, but again the people who really care make it happen. If we already know that the author’s manuscript is permitted, we don’t add these to Asana, but keep them in the spreadsheet until we are ready for them. We contact publishers in batches, trying to group citations by journal and publisher to increase efficiency so we can send one letter to cover many articles or chapters. We note to follow up with a reminder in one month, and then again in a month after that. Usually the second notice is enough to catch the attention of the publisher. As they respond, we move the citation to either posting publisher’s PDF section or to author’s manuscript section, or if it’s not permitted at all to the post to SelectedWorks section. While we’ve tried several different procedures, I’ve determined it’s best for the liaison librarians to ask just for author’s accepted manuscripts for items after we’ve verified that no other version may be posted. And if we don’t ever get them, we don’t worry about it too much. I hope you’ve gotten some ideas from this post about your own procedures and new tools you might try. Even more, I hope you’ll think about which pieces of your procedures are really working for you, and discard those that aren’t working any more. Your own situation will dictate which those are, but let’s all stop beating ourselves up about not achieving perfection. Make sure to let your repository stakeholders know what works and what doesn’t, and if something that isn’t working is still important, work collaboratively to figure out a way around that obstacle. That type of collaboration is what led to our partnership with the Office of Institutional Research to use the Digital Measures platform for our collection development, and that in turn has led to other collaborative opportunities. Confused about SHARE? Let’s fix that! The latter two responses were by far the most popular. While encouraging to know that I had picked an interesting topic, it did worryingly confirm my suspicion that people just don’t *get* SHARE. Perhaps some of this uncertainty is due to the ARL effect, wherein non-ARL libraries don’t receive updates and/or feel disconnected from the initiative. I think the equally large issue, however, falls to marketing. 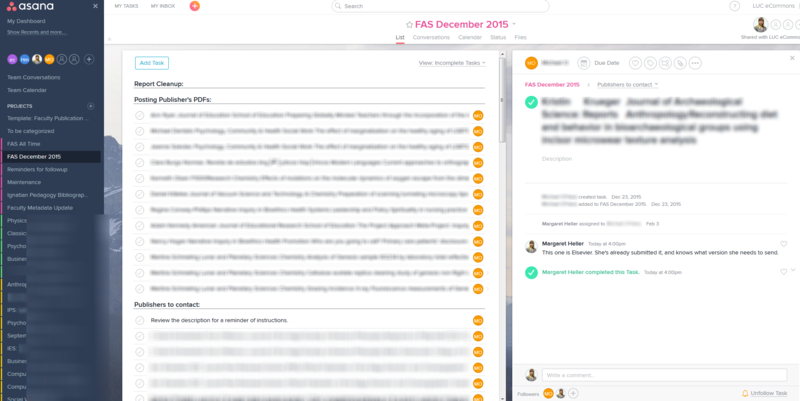 Soon after announcing the overview of SHARE, ARL revealed the first stage in development: the notification system. The notification system initially set out to provide a unified mechanism to alert interested parties of the publication of articles and “release of research” (which includes data) from an institution/researcher/grant agency/etc…The notification system would pull metadata from various repository platforms, funding agencies, institutions, and publishers to provide a mega-search interface, which seems similar to the premise of DPLA. The project plan proposed an 18 month timeline from concept to product, which appears to have been met, although I would argue that some notable changes have occurred along the way. Perhaps because SHARE referenced the OSTP memo and perhaps because of how some conversations were framed, many people began to view SHARE as an alternative or competitor to CHORUS: the publisher-led initiative to bring publications into alignment with the OSTP memo. It seemed that, early on, SHARE did not do much to discourage that perception. However, since 2013 two notable changes occurred: the pivot away from a head-to-head relationship with CHORUS and the partnership with the Center for Open Science (COS). From my perspective, I did think that SHARE was trying to be academia’s answer to the OSTP memo and was, as such, in an antithetical relationship with CHORUS. As agencies began to respond to the OSTP directive and include language about CHORUS as a partner in meeting the public access to publications section, I was concerned that SHARE had lost an opportunity to align with the funders themselves. In late 2014, a representative from SHARE participated in a webinar with a representative from CHORUS and it was clear that neither one had an interest in pitting the two ventures against each other. Rather, they positioned their services as complementary – although SHARE was looking beyond the funder compliance issue. SHARE’s biggest departure from CHORUS with respect to “collection scope” is the inclusion of research data and other research content that may not reside with a publishing entity (this is also part of what sets SHARE apart from OAIster). While all of this is well and good, I could not find additional information or news blurbs that made it clear that SHARE and CHORUS were not competitors. This is a big problem. If people think you are competing with another group that is being consistently brought in as a partner with federal agencies, people are going to think that you are losing the competition. If, however, you are *not* in competition, but are actually doing something with a larger and more holistic scope with respect to scholarly products…well, that’s another kettle of fish altogether. And here is an example of a true marketing failure. Whether or not you *want* to be considered in a competition, if other people think you are and think you are failing, they will not choose to engage with your efforts. The partnership with COS in summer 2104 heralded a new platform, the Open Science Framework (OSF), and dedicated development to the notification system (SHARE also received IMLS and Sloan funding to support its work). As a result, SHARE launched a new website with updated branding and promotional materials, as well as a new knowledge base (aka FAQ), updates page, and SHARE Notify page. In terms of usability, the new site is a huge improvement (with an important exception – see below). It is also much easier to find detailed information about the notification service because all the documentation is hosted on OSF. The communication from SHARE via Twitter (@share-research) is a steady stream of updates and, if you know to look for it, a good way to track growth and new developments. Hopefully this history and statement of purpose makes you excited that libraries and higher education organizations are taking such a coordinated and proactive role in bringing the intellectual output of academic institutions together in a searchable way. What’s that? I didn’t actually talk about how to search SHARE or use the notification system? Yeah, about that…Here’s where the great usability of the website falls down a bit. You can search SHARE, once you go to the Share Notify page and click the hyperlinked text to browse or search the database. I do not understand why this is not more accessible from the main page. This is the first ‘tangible’ deliverable from SHARE (albeit a beta release)…why are they hiding it? Moreover, from the search interface you can see the participating institutions, which includes non-ARL libraries, subject repositories, and international institutions. Perhaps you are wondering why you would want to use the notification system, if you can just search the database? I had the opportunity to speak with Judy Ruttenberg from ARL about the SHARE project at ALA Midwinter in Boston. A wonderful use case that she gave of the SHARE Notify system was one involving liaison librarians. Liaisons could set up a notification for faculty in their departments and then, once alerted, could have an opening for a conversation with the faculty member about visibility, potential impacts, or whatever other topic the liaison may want to leverage the notification for. I love this. I could see myself using this feature to be alerted when a publication from a faculty member was released and if it had an associated funder mandate. I can loop back around to that faculty member and ensure that what we had planned to comply with the public access policies was still on track, and this may open up additional conversation for future research. This was the clearest example of the practicality of the SHARE Notify system, from a “public services” librarian perspective. I currently liaise to several departments and a tool that could consolidate updates from across the research life-cycle would be a welcome one. Screenshot of FAQ on notifications. 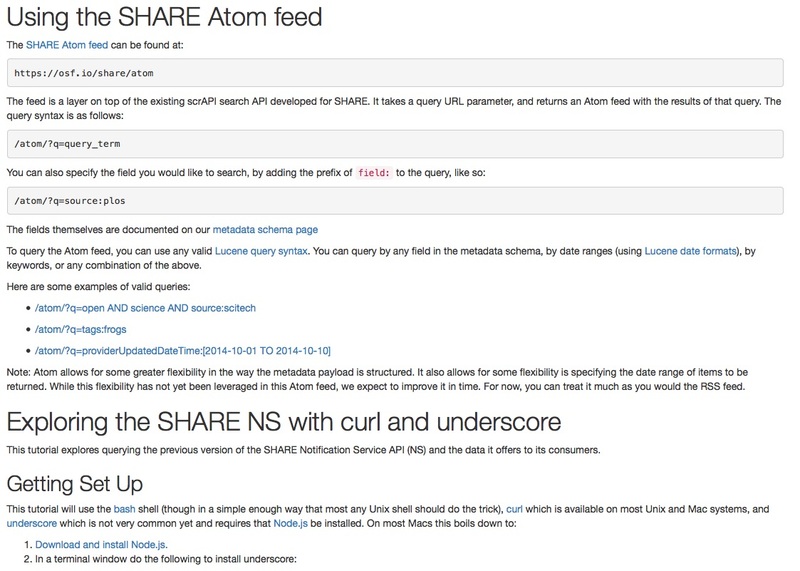 Screenshot describing the Atom feed. This is just not something that I can see a multitude of liaison librarians setting up. Never mind that an RSS feed is already only going to appeal to a smaller subset of the population, but when you provide this kind of instruction it is improbable that someone completely new to the technology is going to take the effort to set this up. To me, this is effectively kills off the stellar use case that Judy proposed. It would make more sense to have someone who was already familiar with the metadata fields – most likely the person who set up participation in the SHARE network – create RSS feeds for various interests. This is not a great use of that person’s time and it creates multiple steps to get the notification to the end-user. The next stage of development for SHARE includes enhancing the minimal level of metadata currently captured and linking related activities, like data and its associated publication. I think these are exciting developments, but it would be disappointing if this product improvement continued in what seems like a vacuum. SHARE has a marketing problem of intention and message penetration. People (if they have heard of SHARE) think of it as a competitor to CHORUS. CHORUS excels at promotion of its partnerships with federal funding agencies, leading spectators to conclude that SHARE is stalling. As this is not the reality, SHARE should do some aggressive outreach to frame its efforts not as a response to the OSTP memo, but rather that the OSTP memo served as the catalyst for an even more ambitious project to reveal academia’s intellectual output in a unified and comprehensive way; to connect anyone with these research outputs, regardless of format; to help expand the reach of information and new knowledge creation; to help with truly democratizing information in a global setting…tell me, doesn’t that inspire you to involve your library in this effort? Isn’t that a more stimulating goal than simply compliance with funder mandates? I sincerely hope that SHARE finds a way to engage more systematically with non-ARL libraries/librarians and can find a way to push this worthwhile ideal throughout higher education. Given the involvement of AAU and APLU, one would hope that university administrators would be asking libraries “what resources do you need to get us involved in this?” I would love to be able to ask librarians from any institution how they were using SHARE and get more than a blank stare or a response that they thought it was just for those “big” institutions. Author Yasmeen ShorishPosted on February 11, 2016 February 10, 2016 Categories academic librarianship, data, digital scholarship, library, linked-data, marketing, metadata, open access, publication, Scholarly Communication1 Comment on Confused about SHARE? Let’s fix that! The Directory of Open Access Journals (DOAJ) is an international directory of journals and index of articles that are available open access. Dating back to 2003, the DOAJ was at the center of a controversy surrounding the “sting” conducted by John Bohannon in Science, which I covered in 2013. Essentially Bohannon used journals listed in DOAJ to try to find journals that would publish an article of poor quality as long as authors paid a fee. At the time many suggested that a crowdsourced journal reviewing platform might be the way to resolve the problem if DOAJ wasn’t a good source. While such a platform might still be a good idea, the simpler and more obvious solution is the one that seems to have happened: for DOAJ to be more strict with publishers about requirements for inclusion in the directory. 1. The process of cleaning up the DOAJ has been going on for some time and is getting close to an important milestone. All the 10,000+ journals listed in DOAJ were required to reapply for inclusion, and the deadline for that is December 30, 2015. After that time, any journals that haven’t reapplied will be removed from the DOAJ. Contrary to popular belief, the process for this started well before the Bohannon piece was published 2. In December 2012 an organization called Infrastructure Services for Open Access (IS4OA) (founded by Alma Swan and Caroline Sutton) took over DOAJ from Lund University, and announced several initiatives, including a new platform, distributed editorial help, and improved criteria for inclusion. 3 Because DOAJ grew to be an important piece of the scholarly communications infrastructure it was inevitable that they would have to take such a step sooner or later. With nearly 10,000 journals and only a small team of editors it wouldn’t have been sustainable over time, and to lose the DOAJ would have been a blow to the open access community. One of the remarkable things about the revitalization of the DOAJ is the transparency of the process. The DOAJ News Service blog has been detailing the behind the scenes processes in detail since May 2014. One of the most useful things is a list of journals who have claimed to be listed in DOAJ but are not. Another important piece of information is the 2015-2016 development roadmap. There is a lot going on with the DOAJ update, however, so below I will pick out what I think is most important to know. In March 2014, the DOAJ created a new application form with much higher standards for inclusion. Previously the form for inclusion was only 6 questions, but after working with the community they changed the application to require 58 questions. The requirements are detailed on a page for publishers, and the new application form is available as a spreadsheet. While 58 questions seems like a lot, it is important to note that journals need not fulfill every single requirement, other than the basic requirements for inclusion. The idea is that journal publishers must be transparent about the structure and funding of the journal, and that journals explicitly labeled as open access meet some basic theoretical components of open access. For instance, one of the basic requirements is that “the full text of ALL content must be available for free and be Open Access without delay”. Certain other pieces are strong suggestions, but not meeting them will not reject a journal. For instance, the DOAJ takes a strong stand against impact factors and suggests that they not be presented on journal websites at all 4.
have an archival arrangement in place with an external party (Question 25). ‘No policy in place’ does not qualify for the Seal. provide permanent identifiers in the papers published (Question 28). ‘None’ does not qualify for the Seal. provide article level metadata to DOAJ (Question 29). ‘No’ or failure to provide metadata within 3 months do not qualify for the Seal. embed machine-readable CC licensing information in article level metadata (Question 45). ‘No’ does not qualify for the Seal. allow reuse and remixing of content in accordance with a CC BY, CC BY-SA or CC BY-NC license (Question 47). If CC BY-ND, CC BY-NC-ND, ‘No’ or ‘Other’ is selected the journal will not qualify for the Seal. have a deposit policy registered in a deposit policy directory. (Question 51) ‘No’ does not qualify for the Seal. allow the author to hold the copyright without restrictions. (Question 52) ‘No’ does not qualify for the Seal. Part of the appeal of the Seal is that it focuses on the good things about open access journals rather than the questionable practices. Having a whitelist is much more appealing for people doing open access outreach than a blacklist. Journals with the Seal are available in a facet on the new DOAJ interface. Part of the reworking of the DOAJ was the requirementand required all currently listed journals to reapply–as of November 19 just over 1,700 journals had been accepted under the new criteria, and just over 800 had been removed (you can follow the list yourself here). For now you can find journals that have reapplied with a green check mark (what DOAJ calls The Tick!). That means that about 85% of journals that were previously listed either have not reapplied, or are still in the verification pipeline 5. While DOAJ does not discuss specific reasons a journal or publisher is removed, they do give a general category for removal. I did some analysis of the data provided in the added/removed/rejected spreadsheet. At the time of analysis, there were 1776 journals on the accepted list. 20% of these were added since September, and with the deadline looming this number is sure to grow. Around 8% of the accepted journals have the DOAJ Seal. There were 809 journals removed from the DOAJ, and the reasons fell into the following general categories. I manually checked some of the journals with only 1 or 2 titles, and suspect that some of these may be reinstated if the publisher chooses to reapply. Note that well over half the removed journals weren’t related to misconduct but were ceased or otherwise unavailable. The work that DOAJ is doing to improve transparency and the screening process is very important for open access advocates, who will soon have a tool that they can trust to provide much more complete information for scholars and librarians. For too long we have been forced to use the concept of a list of “questionable” or even “predatory” journals. A directory of journals with robust standards and easy to understand interface will be a fresh start for the rhetoric of open access journals. Are you the editor of an open access journal? What do you think of the new application process? Leave your thoughts in the comments (anonymously if you like). As I typed the title for this post, I couldn’t help but think “Well, yeah. What else would the library be?” Instead of changing the title, however, I want to actually unpack what we mean when we say “research partner,” especially in the context of research data management support. In the most traditional sense, libraries provide materials and space that support the research endeavor, whether it be in the physical form (books, special collections materials, study carrels) or the virtual (digital collections, online exhibits, electronic resources). Moreover, librarians are frequently involved in aiding researchers as they navigate those spaces and materials. This aid is often at the information seeking stage, when researchers have difficulty tracking down references, or need expert help formulating search strategies. Libraries and librarians have less often been involved at the most upstream point in the research process: the start of the experimental design or research question. As one considers the role of the Library in the scholarly life-cycle, one should consider the ways in which the Library can be a partner with other stakeholders in that life-cycle. With respect to research data management, what is the appropriate role for the Library? In order to achieve effective research data management (RDM), planning for the life-cycle of the data should occur before any data are actually collected. In circumstances where there is a grant application requirement that triggers a call to the Library for data management plan (DMP) assistance, this may be possible. But why are researchers calling the Library? Ostensibly, it is because the Library has marketed itself (read: its people) as an expert in the domain of data management. It has most likely done this in coordination with the Research Office on campus. Even more likely, it did this because no one else was. It may have done this as a response to the National Science Foundation (NSF) DMP requirement in 2011, or it may have just started doing this because of perceived need on campus, or because it seems like the thing to do (which can lead to poorly executed hiring practices). But unlike monographic collecting or electronic resource acquisition, comprehensive RDM requires much more coordination with partners outside the Library. Steven Van Tuyl has written about the common coordination model of the Library, the Research Office, and Central Computing with respect to RDM services. The Research Office has expertise in compliance and Central Computing can provide technical infrastructure, but he posits that there could be more effective partners in the RDM game than the Library. That perhaps the Library is only there because no one else was stepping up when DMP mandates came down. Perhaps enough time has passed, and RDM and data services have evolved enough that the Library doesn’t have to fill that void any longer. Perhaps the Library is actually the *wrong* partner in the model. If we acknowledge that communities of practice drive change, and intentional RDM is a change for many of the researchers, then wouldn’t ceding this work to the communities of practice be the most effective way to stimulate long lasting change? The Library has planted some starter seeds within departments and now the departments could go forth and carry the practice forward, right? The data/information landscape is still changing. In addition to the fact that more funders are requiring DMPs, more research can benefit from using openly available (and well described – please make it understandable) data. While researchers are experts in their domain, the Library is still the expert in the information game. At its simplest, data sources are another information source. The Library has always been there to help researchers find sources; this is another facet of that aid. More holistically, the Library is increasingly positioning itself to be an advocate for effective scholarly communication at all points of the scholarship life-cycle. This is a logical move as the products of scholarship take on more diverse and “nontraditional” forms. 2. Preservation and access. Libraries are the experts in the preservation and access of materials. Central Computing is a critical institutional partner in terms of infrastructure and determining institutional needs for storage, porting, computing power, and bandwidth but – in my experience – are happy to let the long-term preservation and access service fall to another entity. Libraries (and archives) have been leading the development of digital preservation best practices for some time now, with keen attention to complex objects. While not all institutions can provide repository services for research data, the Library perspective and expertise is important to have at the table. Moreover, because the Library is a discipline-agnostic entity, librarians may be able to more easily imagine diverse interest in research data than the data producer. This can increase the potential vehicles for data sharing, depending on the discipline. Yes, RDM and data services are reaching a place of maturity in academic institutions where many Libraries are evaluating, or re-evaluating, their role as a research partner. While many researchers and departments may be taking a more proactive or interested position with RDM, it is not appropriate for Libraries to be removed from the coordinated work that is required. Libraries should assert their expertise, while recognizing the expertise of other partners, in order to determine effective outreach strategies and resource needs. Above all, Libraries must set scope for this work. Do not be deterred by the increased interest from other campus entities to join in this work. Rather, embrace that interest and determine how we all can support and strengthen the partnerships that facilitate the innovative and exciting research and scholarship at an institution. Data, data everywhere…but do we want to drink? The role of data, digital curation, and scholarly communication in academic libraries. Ask around and you’ll hear that data is the new bacon (or turkey bacon, in my case. Sorry, vegetarians). It’s the hot thing that everyone wants a piece of. It is another medium with which we interact and derive meaning from. It is information; potentially valuable and abundant. But much like [turkey] bacon, un-moderated gorging, without balance or diversity of content, can raise blood pressure and give you a heart attack. To understand how best to interact with the data landscape, it is important to look beyond it. What do academic libraries need to know about data? A lot, but in order to separate the signal from the noise, it is imperative to look at the entire environment. To do this, one can look to job postings as a measure of engagement. The data curation positions, research data services departments, and data management specializations focus almost exclusively on digital data. However, these positions, which are often catch-alls for many other things do not place the data management and curation activities within the larger frame of digital curation, let alone scholarly communication. Missing from job descriptions is an awareness of digital preservation or archival theory as it relates to data management or curation. In some cases, this omission could be because a fully staffed digital collections department has purview over these areas. Nonetheless, it is important to articulate the need to communicate with those stakeholders in the job description. It may be said that if the job ad discusses data curation, digital preservation should be an assumed skill, yet given the tendencies to have these positions “do-all-the-things” it is negligent not to explicitly mention it. Digital curation is an area that has wide appeal for those working in academic and research libraries. The ACRL Digital Curation Interest Group (DCIG) has one of the largest memberships within ACRL, with 1075 members as of March 2015. The interest group was intentionally named “digital curation” rather than “data curation” because the founders (Patricia Hswe and Marisa Ramirez) understood the interconnectivity of the domains and that the work in one area, like archives, could influence the work in another, like data management. For example, the work from Digital POWRR can help inform digital collection platform decisions or workflows, including data repository concerns. This Big Tent philosophy can help frame the data conversations within libraries in a holistic, unified manner, where the various library stakeholders work collaboratively to meet the needs of the community. The absence of a holistic approach to data can result in the propensity to separate data from the corpus of information for which librarians already provide stewardship. Academic libraries may recognize the need to provide leadership in the area of data management, but balk when asked to consider data a special collection or to ingest data into the institutional repository. While librarians should be working to help the campus community become critical users and responsible producers of data, the library institution must empower that work by recognizing this as an extension of the scholarly communication guidance currently in place. This means that academic libraries must incorporate the work of data information literacy into their existing information literacy and scholarly communication missions, else risk excluding these data librarian positions from the natural cohort of colleagues doing that work, or risk overextending the work of the library. This overextension is most obvious in the positions that seek a librarian to do instruction in data management, reference, and outreach, and also provide expertise in all areas of data analysis, statistics, visualization, and other data manipulation. There are some academic libraries where this level of support is reasonable, given the mission, focus, and resourcing of the specific institution. However, considering the diversity of scope across academic libraries, I am skeptical that the prevalence of job ads that describe this suite of services is justified. Most “general” science librarians would scoff if a job ad asked for experience with interpreting spectra. The science librarian should know where to direct the person who needs help with reading the spectra, or finding comparative spectra, but it should not be a core competency to have expertise in that domain. Yet experience with SPSS, R, Python, statistics and statistical literacy, and/or data visualization software find their way into librarian position descriptions, some more specialized than others. For some institutions this is not an overextension, but just an extension of the suite of specialized services offered, and that is well and good. My concern is that academic libraries, feeling the rush of an approved line for all things data, begin to think this is a normal role for a librarian. Do not mistake me, I do not write from the perspective that libraries should not evolve services or that librarians should not develop specialized areas of expertise. Rather, I raise a concern that too often these extensions are made without the strategic planning and commitment from the institution to fully support the work that this would entail. Framing data management and curation within the construct of scholarly communication, and its intersections with information literacy, allows for the opportunity to build more of this content delivery across the organization, enfranchising all librarians in the conversation. A team approach can help with sustainability and message penetration, and moves the organization away from the single-position skill and knowledge-sink trap. Subject expertise is critical in the fast-moving realm of data management and curation, but it is an expertise that can be shared and that must be strategically supported. For example, with sufficient cross-training liaison librarians can work with their constituents to advise on meeting federal data sharing requirements, without requiring an immediate punt to the “data person” in the library (if such a person exists). In cases where there is no data point person, creating a data working group is a good approach to distribute across the organization both the knowledge and the responsibility for seeking out additional information. Data specialization cuts across disciplinary bounds and concerns both public services and technical services. It is no easy task, but I posit that institutions must take a simultaneously expansive yet well-scoped approach to data engagement – mindful of the larger context of digital curation and scholarly communication, while limiting responsibilities to those most appropriate for a particular institution. Lest the “data-information-knowledge-wisdom” hierarchy (DIKW) torpedo the rest of this post, let me encourage readers to allow for an expansive definition of data. One that allows for the discrete bits of data that have no meaning without context, such as a series of numbers in a .csv file, and the data that is described and organized, such as those exact same numbers in a .csv file, but with column and row descriptors and perhaps an associated data dictionary file. Undoubtedly, the second .csv file is more useful and could be classified as information, but most people will continue to call it data. Yasmeen Shorish is assistant professor and Physical & Life Sciences librarian at James Madison University. She is a past-convener for the ACRL Digital Curation Interest Group and her research focus is in the areas of data information literacy and scholarly communication.